President Donald Trump reaches to shake Turkish President Recep Tayyip Erdogan’s hand at a meeting ahead of the United Nations General Assembly in 2017. When President Trump tried to strong-arm Turkey into releasing a detained American pastor this month, he gambled that a barrage of punishing measures — market-rattling economic sanctions and humiliating public rebukes — would force President Recep Tayyip Erdogan to quickly relent. That has not happened. More than three weeks after the crisis started, the pastor, Andrew Brunson, is still under house arrest in Turkey. And Erdogan, for the moment, appears unbowed. As the Turkish currency swoons, Erdogan has focused domestic anger instead against the United States and portrayed his country as the victim of intentional sabotage — shifting attention from economic problems that analysts said his government has failed for years to adequately address. [post_ads]Turkey has also received timely displays of support from foreign allies that have undermined the Trump administration’s effort to isolate it. These include a visit to Ankara by Russia’s foreign minister, a phone call between Erdogan and French President Emmanuel Macron, and a pledge by Qatar to invest $15 billion in the Turkish economy. Turkey “will not surrender to those who act like a strategic partner but make us a strategic target,” Erdogan said on Saturday, according to the semiofficial Anadolu news agency, in the latest of his daily broadsides aimed at the White House. The feud has been costly for Turkey, pushing its currency, the lira, to record lows against the dollar. But Erdogan’s ability to benefit from the crisis has raised questions about whether Trump underestimated the Turkish leader, a “nimble tactician” who is convinced that Western powers are bent on crippling Turkey because of its status as a strong Muslim nation, said Lisel Hintz, a professor of international relations at Johns Hopkins University’s School of Advanced International Studies. Erdogan’s focus on foreign adversaries when facing domestic challenges, including tight elections, has been part of “a familiar script,” said Soli Ozel, a professor of international relations at Kadir Has University in Istanbul. “The distinction this time is there is very strong evidence that there has been a declaration of hostile intent against Turkey,” he added, referring to harsh U.S. measures that seem aimed, Ozel said, at “breaking Turkey’s back.” The effect “has been to confirm for many Turks that this is not just an economic crisis. And it might not even be an economic crisis, but economic warfare by the United States,” he said. After Erdogan called for a boycott of U.S.-made electronic products, including Apple’s iPhone, videos of Turkish citizens destroying their iPhones with hammers or baseball bats went viral on social media. To enlist allies in the fight, Erdogan has temporarily put aside his thorny relations with European leaders. Turkish officials took pains to highlight Erdogan’s telephone calls last week in the middle of the crisis with Macron and German Chancellor Angela Merkel. Also last week, Turkish courts released from prison two Greek soldiers and Amnesty International’s local honorary chair. These moves may have been intended to soften perceptions of Turkey in Europe at a critical moment, analysts said. Erdogan has made clear that he’s sending a signal. “Before it is too late, Washington must give up the misguided notion that our relationship can be asymmetrical and come to terms with the fact that Turkey has alternatives,” Erdogan wrote in an Aug. 10 op-ed published in the New York Times. 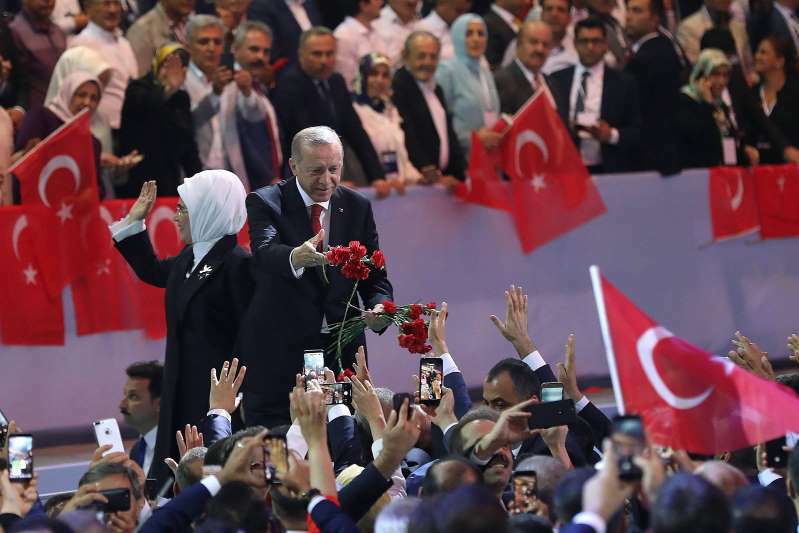 His brinkmanship carries little domestic political risk for Erdogan, who was reelected in June and assumed vast new powers under a new presidential system. That comes on top of a years-long crackdown on enemies and dissidents and the shuttering or neutering of independent media outlets. His political opponents have been jailed, or they remain too weak and divided to effectively challenge him. Still, criticisms of his government have broken through, focusing on its pursuit of unsustainable growth, the debt exposure of its banks and companies, and sweetheart deals. They also target Erdogan’s decision to appoint his son-in-law as the country’s finance and treasury minister, and his aversion to raising interest rates. The economic problems had grown so acute that Erdogan called for elections in June, more than 18 months ahead of schedule, in what analysts said was an attempt to get ahead of possible political fallout. The Brunson case is far from the only source of tension between Turkey and the United States. In recent years, they have argued about the conduct of the war in Syria and over Turkey’s weapons purchases. Ankara has demanded the extradition of a U.S.-based Turkish cleric, Fethullah Gulen, for what the Turkish authorities say was his role in orchestrating a coup attempt against Erdogan’s government two years ago. Gulen has denied involvement. Turkey is also prosecuting half a dozen American citizens in addition to Brunson on what U.S. officials say are political charges, along with three Turkish employees of the U.S. mission in the country. But until recent weeks, Erdogan and Trump by all accounts had a warm personal relationship. The feud between them erupted after a deal to bring Brunson home collapsed, according to people familiar with the details. Trump appeared to publicly acknowledge an element of that deal on Thursday when he said that “we got somebody out for him,” a reference to efforts on Erdogan’s behalf to win the release of a Turkish citizen held by Israel. When the deal collapsed, the conflict between the United States and Turkey became especially acrimonious. Erdogan “wants to dig in,” said Sinan Ciddi, executive director of the Institute of Turkish Studies at Georgetown University. “That seems to have paid off in the immediate term.” But that could become harder if the White House and Congress take additional steps to punish Turkey — “Then what does he have up his sleeve?” Ciddi asked, mentioning a Senate proposal introduced last month that would restrict loans to Turkey from international financial institutions if Ankara did not release U.S. citizens. A sustained crisis could harm Erdogan’s carefully cultivated legacy, with the economic gains of Turks at its centerpiece. In that scenario, if prices start to rise because of inflation, undoing the president’s signal achievement, it would “rattle people’s confidence in the leader they believed had achieved so much,” Hintz said.